The road to becoming a trader can be a dirty one filled with lots of self-sacrifice and many less than ideal situations. I have nothing against the “smoother” journeys, but there is something a bit more extra motivating when someone has to dig deep in order to get to where they want to go. Our guest, Brad (chatroom alias, “Darb24”), is someone who I have a ton of respect for. His journey has by no means been easy, but he never once complained or pulled out the victim card. He sucked it up, got dirty (and continues to get dirty) and made things happen. I know the saying is way overused, but it’s truly the case here: where there is a will, there is a way. Put on your hard hat (well… welder’s mask) and let’s get motivated with Brad! Today we talk with community member Brad. He came from a modest upbringing and didn’t think he had any real access to the market for that reason. 401k’s and long term retirement investing is what actually introduced him to the market. 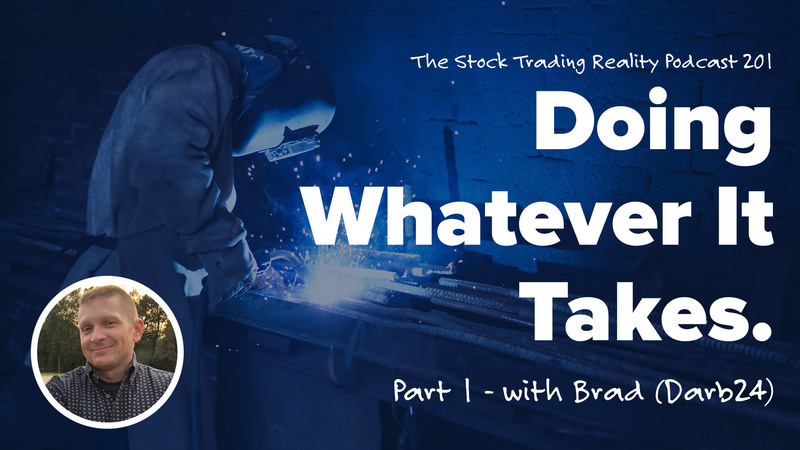 Brad struck up a conversation with a coworker who said he he was trading in the market. This unfortunately was at the same time as the crash in 2008 which led to a difficult time regarding his employment and income. Needless to say, trading still wasn’t in the picture yet. While he found some great paying jobs, most of the time it kept him away from his family so he moved back and worked locally for quite a few years. After changing jobs a few times, he eventually got back onto the idea of trading. One day Brad was searching for reviews on trucks and stumbled upon Clay’s video about the new truck he bought. He about fell off the end of the hotel bed when Clay mentioned ‘trading’ at the very end. This led him to investigate further and ultimately join the community. While going through the courses, Brad funded an offshore account just to get his feet wet in the market. It did not help that he had initially been paper trading unrealistically but regardless, he was able to truly see the voices that appear when real money is on the line. I never looked at the stock market as something that somebody like me could take part in. I thought it was for rich people in New York City. I ended up taking a local job back home and worked there for 5 years but trading was always in the back of my mind. I was driving to work one morning thinking ‘there has got to be a better way to make a living’ and trading came back to mind. I’m spending the money on education and CTU. I opened up a SureTrader account with $1,000 and if it dropped to $500 I would close it. In a few weeks it dropped to $500.